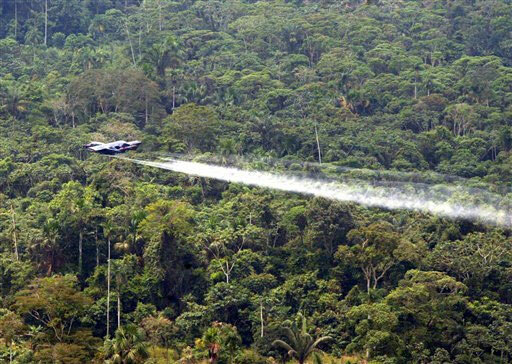 BUENOS AIRES, Apr 28 2015 (IPS) - After the World Health Organisation (WHO) declared glyphosate a probable carcinogen, the campaign has intensified in Latin America to ban the herbicide, which is employed on a massive scale on transgenic crops. In a Mar. 20 publication, the WHO’s International Agency for Research on Cancer (IARC) reported that the world’s most widely used herbicide is probably carcinogenic to humans, a conclusion that was based on numerous studies. Social organisations and scientific researchers in Latin America argue that thanks to the report by the WHO’s cancer research arm, governments no longer have an excuse not to intervene, after years of research on the damage caused by glyphosate to health and the environment at a regional and global level. “We believe the precautionary principle should be applied, and that we should stop accumulating studies and take decisions that could come too late,” said Javier Souza, coordinator of the Latin American Pesticide Action Network (RAP-AL). The precautionary principle states that even if a cause-effect relationship has not been fully established scientifically, precautionary measures should be taken if the product or activity may pose a threat to health or the environment. “We advocate a ban on glyphosate which should take effect in the short term with restrictions on purchasing, spraying and packaging,” Souza, who is also the head of the Centre for Studies on Appropriate Technologies in Argentina (CETAAR), told IPS. Carlos Vicente, a leader of the international NGO GRAIN, told IPS that the herbicide first reached Latin America in the mid-1970s and that its use by U.S. biotech giant Monsanto spread massively in the Southern Cone countries. “Its widespread use mainly involves transgenic crops, genetically modified to tolerate glyphosate, such as RR (Roundup Ready) soy, introduced in Argentina, Brazil, Paraguay, Uruguay and other countries,” said Vicente, a representative of GRAIN, which promotes the sustainable management and use of agricultural biodiversity. There are 50 million hectares of transgenic soy in the region, and 600 million litres a year of the herbicide are used annually, he said. According to Souza, there are 83 million hectares of transgenic crops in Argentina, Bolivia, Brazil, Paraguay and Uruguay alone. The WHO report “is very important because it shows that despite the pressure from Monsanto, independent science at the service of the common good rather than corporate interests is possible,” Vicente said. Monsanto sells glyphosate under the trade name Roundup. But it is also sold as Cosmoflux, Baundap, Glyphogan, Panzer, Potenza and Rango. And among small farmers in some countries, it is popularly referred to as “randal”. It is used not only on transgenic crops but also on vegetables, tobacco, fruit trees and plantation forests of pine or eucalyptus, as well as in urban gardens and flowerbeds and along railways. But in traditional agriculture it is used after the seeds germinate and before they are planted, while in transgenic crops it is used during planting, when it acts in a non-selective fashion, thus destroying a variety of plants and grass, according to RAP-AL.